Happy Monday, reader! I’ve got another messy glitter mani to share, because I can never say no to glitter. 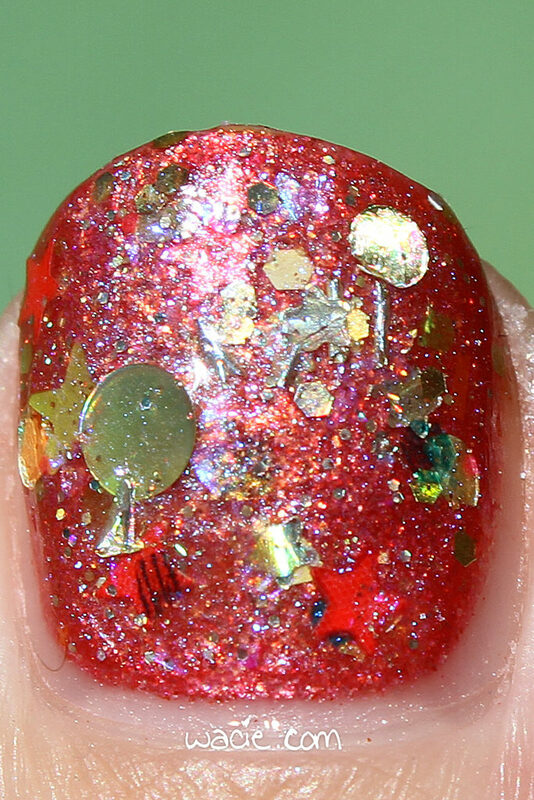 This is Lynnderella‘s Unicornament over a Maybelline vintage mystery polish. I’ll start with Unicornament, since it’s clearly front and center in this look. This is probably my favorite-ever Lynn, because there’s so much happening in it. All that color, glitter, shapes, and bling in an iridescent base, it’s irresistible. I felt a little bad covering the base polish up, because it really is a nice polish. It’s a warm pink — or cool red, I can’t tell — with silver flecks. I’ve had this polish for at least ten years, and believe it or not, it still applies really well. It could have done with some thinner, but it wasn’t thick enough that I thought it was necessary. I’ll have to do another look with it soon so that it gets its due. Maybelline polishes are sold in stores. Lynnderella polishes are available on their website, Amazon, and eBay. 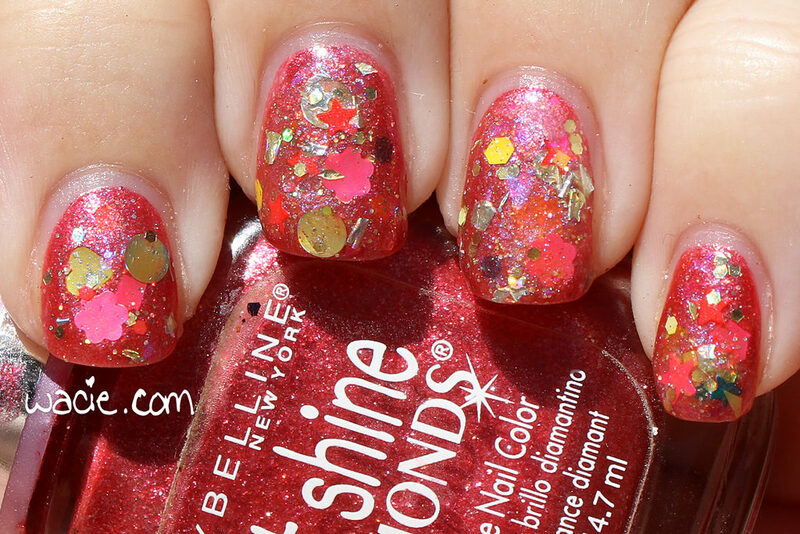 This entry was posted in Manicure Monday and tagged glitter, indie, Lynnderella, Maybelline, mystery color, pink, red, vintage. I’m not really into glitter toppers these days, but I do love that vintage Maybelline. So many fun shapes and colors in the topcoat! So fun! And it looks great over the Maybelline polish. This is fun! I love a good chunky glitter topper. I wish more indies would create them. 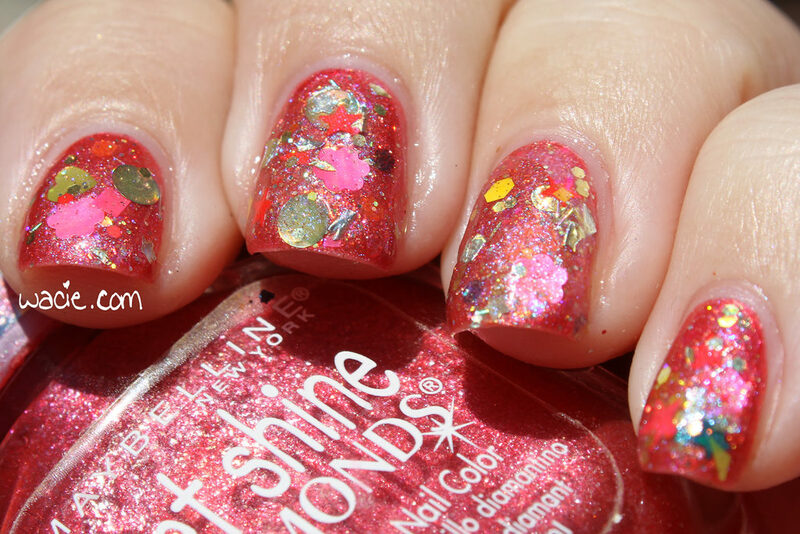 Glitters are always fun to pull out, and Lynderella was certainly key to making glitter polishes popular! Oh so much glittery fun! This is such a fun mani, you must try this again at Christmas time! Such a throw back to the days of chunky glitter. I often wonder, will it ever make a comeback? I love me a good glitter topper!!! That maybelline is for sure a vintage polish. It speaks well for them that it hasn’t dried up or anything. Loved this manicure so many great shapes and glitter. Multilayered and fun.